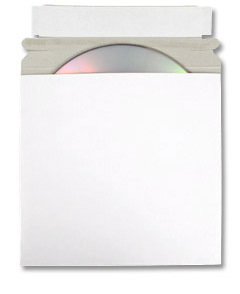 Cardboard CD mailers are another form of optical media packaging designed to withstand the elements when shipped or distributed. These lightweight CD packaging options serves double duty by containing primary packaging such as a jewel case and then functioning as a shipping mailer. A disc can be inserted into the cardboard mailer without additional packaging, as well. Cardboard mailers have a marked difference in size compared to bubble mailers as most of them are constructed much smaller to snugly fit the shape of its media while maintaining rectangular or square dimensions. Transparent plastic windows and custom printing on the cardboard’s surface are additional options that allow these mailers to create an impact when distributed. Like bubble mailers, many of this type of packaging come with adhesive seal strips that safely keep the disc in place. Custom printed CD mailers paired with adhesive seal strips are a professional solution for your disc project! You can often can down on shipping and packaging costs using this option because even CD sized cardboard mailers meet USPS guidelines in that postage can be affixed directly on the mailer without adding another envelope or box for transport. It is both packaging and shipping container, all in one.